In Thailand, unrest continues with no end in sight. The effects are spreading as unrest continues in Greece and is now beginning in Spain. Are these economic protests the beginning of social revolutions? In Southeast Asia turmoil continues in Thailand as protesters see no end in sight. 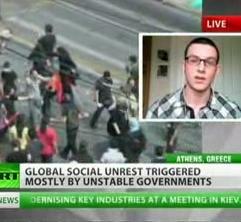 The effects are spreading as unrest continues in Greece and is now beginning in Spain. Are these economic protests the beginning of social revolutions? As the Greek government begins to push for investigations of investment banks, Andrew Gavin Marshall from the Center for Research on Globalization says it’s more than just the banks who are to blame for the crisis. “Ultimately everyone is responsible in a position of power. The previous Greek governments have been responsible for their bad policies and their collusion with the investment banks. It’s not about one or the other, it’s central banks, investment banks and government power. Together they have all accumulated this bad debt” said Marshall. Marshall called recent events a “crisis of western civilization.” Citing US Intelligence Director Denis Blair, he said the greatest threat to national security is the regime-threatening instability that could result from the financial crisis. “In an economic decline, you see imperial mobilization. As empires decline, as the US empire is declining you see rapid increased international violence and war. You see this militarization abroad, but also the homeland security state at home, which is more about controlling the people than protecting the people. It’s a very global issue; you will have people rising up in rebellion everywhere,” Marshall said.